Premise: A 50 year old bachelor discovers that he has an adult son and a baby granddaughter. Verdict: This is pretty watchable. 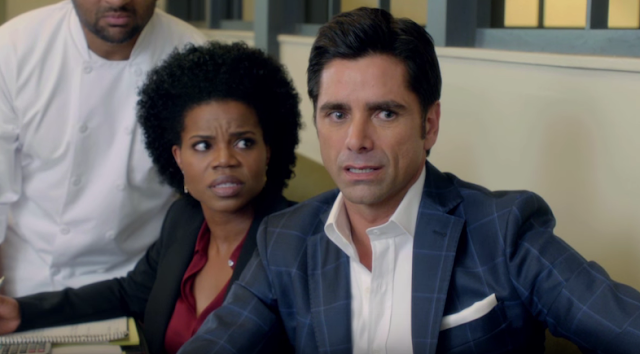 John Stamos plays a charming 50 something bachelor who doesn’t have an issue picking up ladies. OK… quite believable so far. His carefree lifestyle is shaken when he discovers that he is a father… and not only that, he is also a grandfather. Comedy ensues. I thought this was a very good premise for a comedy. It is simple and it feels like a classic family sitcom with a twist. John Stamos is perfect for the role and I love that they got Sara Kingsley (Community) as his ex/potential love interest. Grandfathered is not edgy or particularly unique, but enjoyable. And sometimes that’s all a comedy needs to be. Should you watch it? Yeah… good to watch when you are in the mood for something light. But what about "Fuller House" ?? ?